UNION, N.J., Jan. 10, 2017 /PRNewswire/ -- Bed Bath & Beyond Inc. (NASDAQ: BBBY) today announced the grand opening of a unique shopping venue in the Sunset Park neighborhood of Brooklyn, New York. Located at 850 3rd Avenue, "BEYOND at Liberty View" houses four of the Company's brands under one roof, including Bed Bath & Beyond®, Face Values®, buybuy BABY® and Cost Plus World Market®. Beyond the experience of these four great stores, the Company has created a fun and productive shopping destination for the entire family featuring a variety of dining options, including a full-service restaurant, as well as live events, such as cooking demonstrations, kid-friendly activities, and more. As part of the Company's commitment to do more for and with its customers, "BEYOND at Liberty View" was designed to offer a high level of customer service that is inspirational, along with expanded offerings, in-store experts, and more differentiated product, services and solutions. Customers already familiar with Bed Bath & Beyond's family of brands are able to take advantage of several new and enhanced services with an expansive assortment of products across multiple categories in the home, baby and, health and beauty space. Digital tools assist customers in providing a seamless and personalized shopping experience, including interactive shopping tools to find the item to fit a specific need. The venue also features a dedicated area called "The Beyond Room," for customers to work with the Company's in-house experts for concierge services, such as personal shopping, registry and soon-to-come, decorating services. 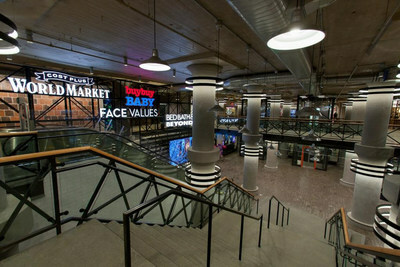 In addition to the retail space, "BEYOND at Liberty View" includes a unique, food hall-style dining experience. The Bay Market Kitchen serves casual American cuisine and locally brewed craft beer, wine and growlers. In addition to the restaurant, there are seasonal market food pods on the second floor, which feature Brooklyn-based Toby's Estate Coffee espresso drinks, drip and pour-over coffee and locally-sourced treats and snacks. An event space, named 71 at BEYOND, has been specially designed for cooking classes, product demonstrations, food sampling, how-to sessions and more, to better serve our customers. "We are thrilled to open BEYOND at Liberty View in the thriving and dynamic Sunset Park community and offer our customers a unique shopping destination featuring a broad assortment of products and outstanding customer service that is common to all of our brands," said Barry Feld, Chief Executive Officer of Cost Plus World Market, who helped spearhead the project on behalf of Bed Bath & Beyond Inc. "We are also excited to be opening our first full Cost Plus World Market store experience in Brooklyn, and to be part of this growing and diverse neighborhood," Feld added. Bed Bath & Beyond (www.bedbathandbeyond.com) is delighted to expand its product offerings by supporting the local design community and offering a "Born in Brooklyn" section inside the store, presenting Brooklyn-based designers and their products in a format that is exclusive to the Sunset Park location. In addition, the store features a Drapery Design Gallery for custom window treatments and a Technology Shop including products that provide 'the connected home' experience. The store also includes concierge, personal shopping, registry, and home delivery services. Face Values (www.harmondiscount.com) features a selection of approximately 20,000 items from the cosmetics, health and beauty categories including popular name brand cosmetics and personal care products, nutritional bars and an extensive assortment of trial and travel size products at everyday low prices. With beauty advisors and makeup stations in-store, Face Values is the place for those who love health and beauty products mixed with a little pampering. And, unique to the Sunset Park location, customers are able to make an appointment (or walk in) with professional stylists to wash, blow and style their hair at the Blow In Blow Out Bar®. buybuy BABY (www.buybuybaby.com) ensures that new and expectant parents have everything they need to confidently welcome their baby and navigate the transitions of life as a family. From a baby registry department and a nursery design center to baby gear and clothes, this Brooklyn location also features a book department with a reading and activity area and a stroller and car seat showroom, allowing new parents to explore different models to find the item that best fits their budget and lifestyle. Cost Plus World Market (www.worldmarket.com) is already well known for its broad and unique assortment of home goods, including furniture, textiles, ceramics and glassware, home décor, artisan gifts, jewelry and accessories, and global food and beverages from around the world. The Sunset Park location has all of these departments as well as an expanded line of consumables, which includes "locally grown" products from Brooklyn, and also features room vignettes which offer the customer solutions for small-space urban living. For more information and a calendar of upcoming events for "BEYOND at Liberty View," visit www.bedbathandbeyond.com/brooklyn. Bed Bath & Beyond Inc. and subsidiaries (the "Company") is a retailer selling a wide assortment of domestics merchandise and home furnishings which operates under the names Bed Bath & Beyond, Christmas Tree Shops, Christmas Tree Shops andThat! or andThat!, Harmon, Harmon Face Values or Face Values, buybuy BABY and World Market, Cost Plus World Market or Cost Plus. Customers can purchase products from the Company either in-store, online, with a mobile device or through a contact center. The Company generally has the ability to have customer purchases picked up in-store or shipped direct to the customer from the Company's distribution facilities, stores or vendors. In addition, the Company operates Of a Kind, an e-commerce website that features specially commissioned, limited edition items from emerging fashion and home designers; One Kings Lane, an authority in home décor and design offering a unique collection of select home goods, designer and vintage items; and PersonalizationMall.com, an industry-leading online retailer of personalized products. The Company also operates Linen Holdings, a provider of a variety of textile products, amenities and other goods to institutional customers in the hospitality, cruise line, healthcare and other industries. Additionally, the Company is a partner in a joint venture which operates retail stores in Mexico under the name Bed Bath & Beyond. The Company operates websites at bedbathandbeyond.com, bedbathandbeyond.ca, worldmarket.com, buybuybaby.com, buybuybaby.ca, christmastreeshops.com, harmondiscount.com, ofakind.com, onekingslane.com, personalizationmall.com, harborlinen.com and t-ygroup.com. As of December 21, 2016, the Company had a total of 1,548 stores, including 1,023 Bed Bath & Beyond stores in all 50 states, the District of Columbia, Puerto Rico and Canada, 279 stores under the names of World Market, Cost Plus World Market or Cost Plus, 112 buybuy BABY stores, 80 stores under the names Christmas Tree Shops, Christmas Tree Shops andThat! or andThat!, and 54 stores under the names Harmon, Harmon Face Values or Face Values.